A shout-out to our horses that have made a spectacular contribution to our team. Here we offer recognition and gratitude to some of the most faithful and hardworking members of our team. This is just a part of our “Thank you” to them for being outstanding in general, and especially in the last year. Our Captain Morgan won out this year when it came to favoritism (though Aztec was a close second). At 12 years old, this Morgan gelding is one steady guy and he is such a joy to ride. We lovingly call him “Barbie horse” because he is practically always clean - how a horse can need so little brushing is amazing. With his desire to please and gorgeously smooth canter, it’s no wonder he is requested! Ringo has been a steady companion for many guests over the years but this past year his steadfastness has been exceptional. He is a joy and a comfort to those who match with him. He is a 12 year old Appendix Quarter Horse, and his thoroughbred shines through in his long lovely gait. Axel is our beautiful strawberry roan. Quite the opposite of the old country ballad, Axel is remarkable for his kindness and assurance. At 6 years old he is the youngest horse in the main guest string, and it is already his second year. He travels out with his usual aplomb, unswerving and consistent. We are very grateful to have such a wonderful young horse with us! This is Guinevere on the day she was born, with her momma Doc. 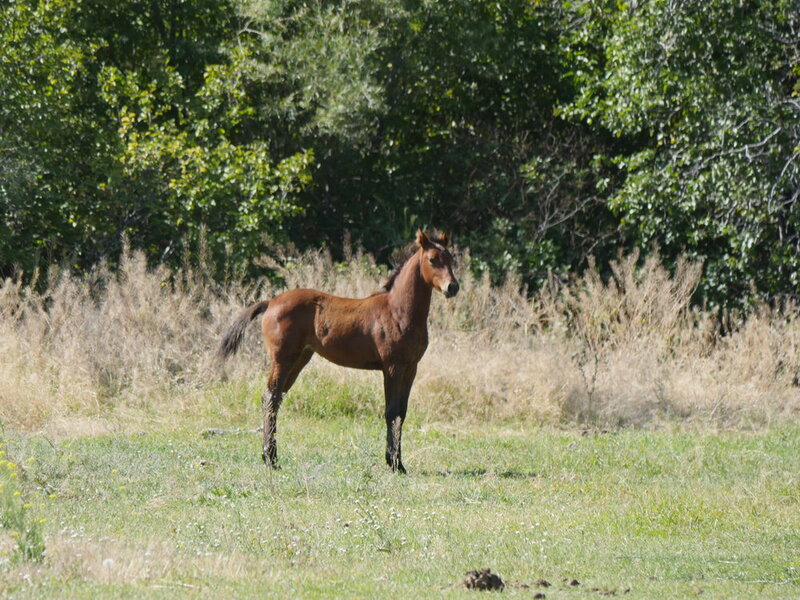 This year we had a beautiful filly, and named her Guinevere in honor of Anna’s son, Arthur. She arrived in June, and is out of Anna’s Colt-to-Maturity project from when she was younger; Doc. 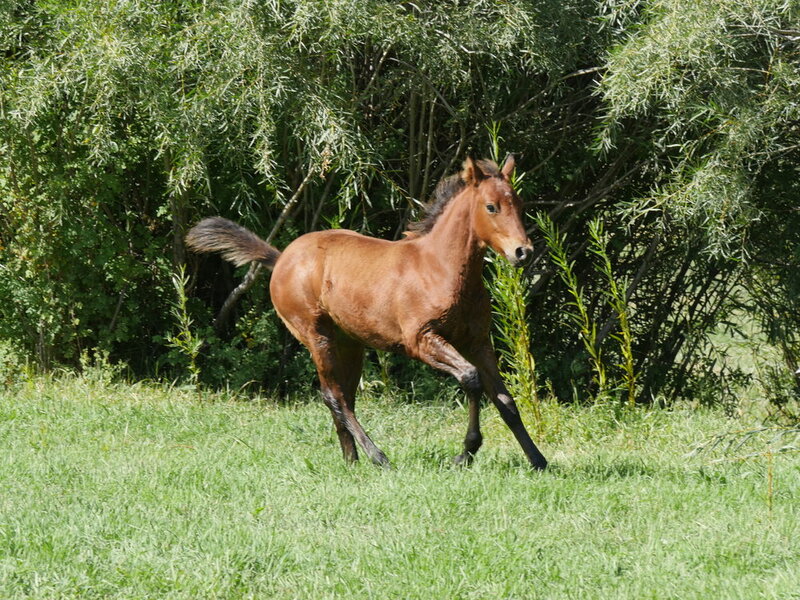 She is by Neptune, the young Friesian-cross-Mustang. She is a very confident little girl and we are very excited for her future! Our dear old Snip passed away this last June. Many of you may remember him as the old horse in the pasture, but this old man helped to teach Maria and Anna how to ride. He was the last living colt from Patty’s breeding string, out of her mare Suzanne Babe who was out of Jag On Babe, who Patty bought when she was a teenager. We all loved Snip dearly, and for many years he was the trusted mount for the grandchildren. He would always lead the way, even with four-year-old on his back, teaching them and safely bringing them home. He gave so much confidence to so many people! Snip was started by Patty and was her personal horse for years. Paul, Dan, and Maria all showed him in the local 4-H competitions. Patty roped from him and he was her go-to horse until he had some trouble with ringbone at twelve. That cleared up though and he was the trusted kid’s horse for the following eighteen years. We offer gratitude to a few of our incredible horses for great achievement over the past year and particular contribution to our team. 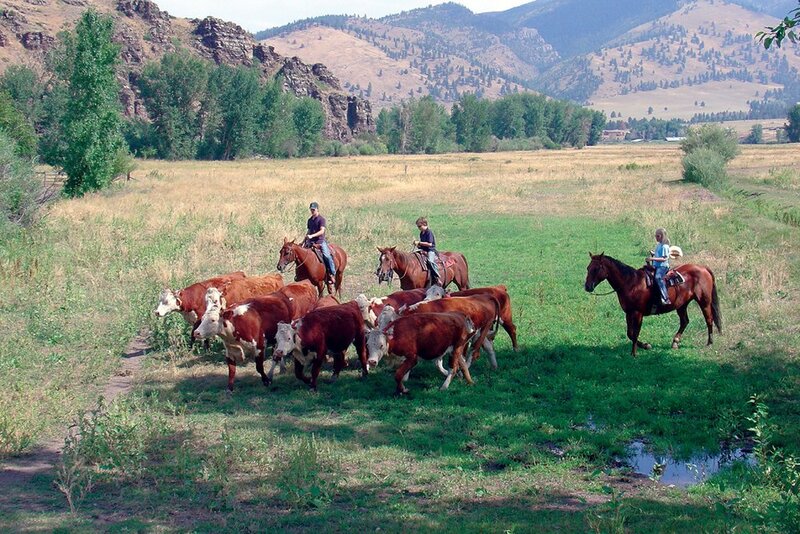 Our horses are the heart and soul of this ranch, and without them we could not do what we do. Cisco gets the award for going "Colt to Guest String" in 2017. At six years old, this little Mustang/Quarter Horse cross is a rock star. At her young age, she is so calm and neatly put together that she has made a niche for herself with people who are frightened of riding. She offers soothing confidence to the nervous rider with the maturity of a much older horse! We are so proud of this little home-bred girl. Who's It gets the award for being "Beyond Priceless." This horse can teach anyone how to ride, and she does so with grace! At 20 years old she is still in excellent health and, other than some TLC for her back occasionally, never asks for the extra attention she deserves. Consistent and reliable, she takes the top marks for her "magic canter," which makes riders feel so comfortable with more speed. Chase gets the award for "Longest Serving Guest Horse" at the Rocking Z. He is officially retired this year! Now, this big Appaloosa was bought by Patty Wirth in 1992 at six months old. He was her rope horse, and became part of the guest string with our first clients in the year 2000. He has had more than 3000 people on his back, although I admit part of that is due to ten people in a day trying out pen-roping on him. Gypsy and Ginger granted us some fantastic fillies this year! Congrats to them on being fabulous mommies. The red one is turning strawberry roan, and belongs to Ginger. Her name is Cinnamon, or Canela, which means cinnamon. The dark one, who will go grey quickly, belongs to Gypsy. Her name is Pearl, as we wanted to name her after one of our favorite people: Margaret. Margaret is Greek for Pearl. They are by the stallion Midnight Corona, and are all Quarter Horse.